I know I know, shame on me, right? 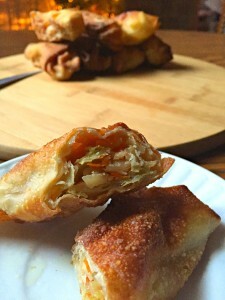 I do love Christmas BUT, I have to rave and share my recipe for Vegetable egg rolls! I post a picture on Instagram of these beauties every time I make them and I have had so many people ask me for the recipe! 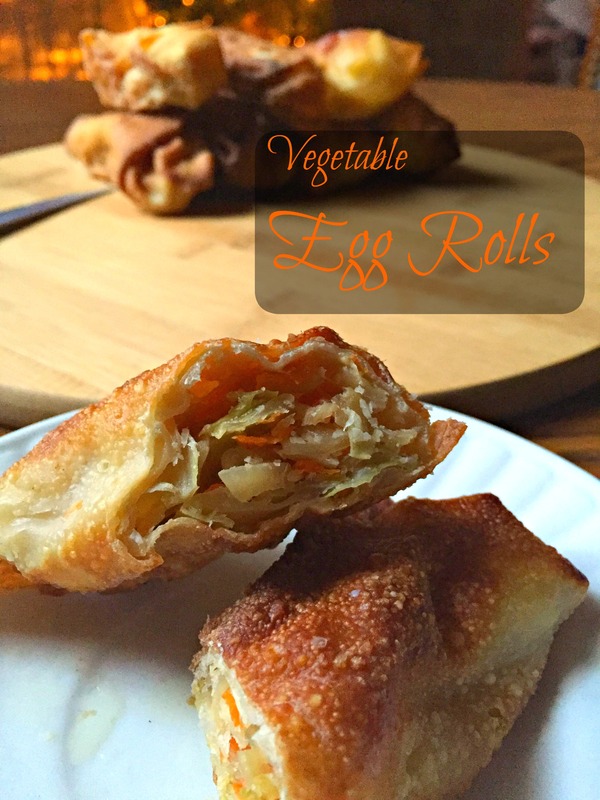 So, even though it is December and I know that you are all probably knee deep in Christmas cookies you can take a break too for these tasty vegetable egg rolls and wonder where the recipe has been all your life because when I started making them back in college I felt the same way! Wash, chop and shred your cabbage. 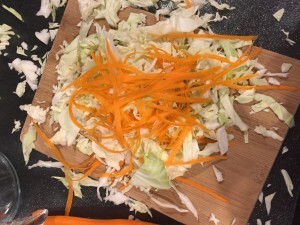 Then clean your carrots and use your peeler to shred the carrots over top of the cabbage. Take about 2 Tbsp Coconut Oil and melt it in a frying pan. 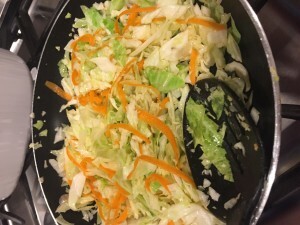 Get your oil hot enough to fry things (about 250 degrees for coconut oil) and add your cabbage, carrots and spices. After about 3 minutes add your soy sauce and continue to fry up until cabbage is complete. Let filling cool in a bowl for about 15 minutes. If the filling is too hot the wrapper will fall apart. 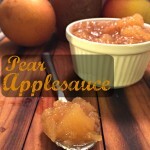 Take about 2 spoonfuls of filling and put it diagonal on the wrapper. 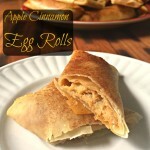 Then roll one side of the filling up and over the filling and then fold the sides in and roll the rest of the way up. Seal with a tiny bit of water and set aside. When complete add coconut oil into a pan until it is about half full (you can melt before hand in the microwave instead of waiting for it to melt). When the oil is hot enough to fry place in your egg rolls. Let them fry on each side until golden brown (about 2 minutes on each side). 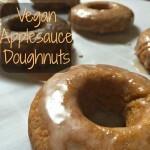 You can also bake them at 425 Degrees Fahrenheit for about 8 minutes (brush coconut oil over top before cooking). 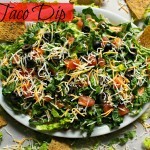 Serve with the dipping sauce of your choice! 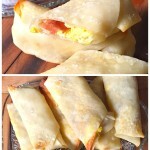 Such a simple yet yummy snack/side dish/meal these Vegetable Egg Rolls are perfect to add to the vegetable fried Rice (Recipe found here) that was a recipe from last week! They are always the most perfect side dish to fried rice or stir fry because they are so yummy and can be froze and used when you need them! They can be frozen for up to 6 months! 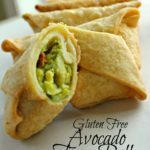 If you are gluten free rice paper can be used instead too! 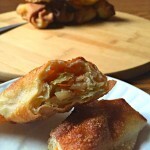 These here make great egg rolls! Blue Dragon Spring Roll Wrappers, 4.7 oz One nice Thing about this recipe is that you can add some chicken, pork or bits of steak if you want to add a little bit more to it. Don’t forget to follow me on Instagram (@notshabbygabby), Twitter (@Not2ShabbyGabby), Pinterest (@Not2ShabbyGabby) and Facebook to stay up to date on all recipes and posts!